Between trailers and spoilers, we already know that the cast of Dawn of Justice is huge. We’re getting Batman and Superman, of course, as well as Alfred, Lex Luthor, Wonder Woman, Lois Lane, Doomsday, Aquaman, General Zod, Cyborg, and even Perry White and Jimmy Olsen. In fact, according to IMDB.com, the entire cast contains a whopping 294 names. While I’m sure a great deal of those are extras in crowd scenes, it still serves as proof of just how massive this movie really is. But, according to director Zack Snyder, he wanted it to be even bigger. 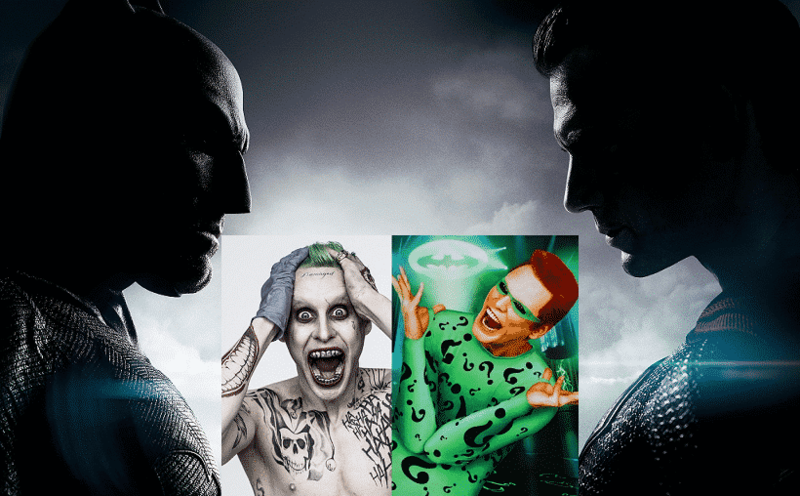 Snyder tells Collider.com that he initially planned to include the Joker and Riddler as well. While he didn’t reveal his specific plans for the characters, it’s fairly certain that they would have been there to make Batman’s day even worse. Apparently, he realized that the cast, while stellar, was in danger of being seriously overblown. To add more characters – especially more primary villains – was to risk turning out like Spider-Man 3. And let’s face it, we never want to be put through that ever again. Ever. That being said, there are definite allusions to Batman’s two big bads. The Riddler’s signature question mark is seen in graffiti in Gotham City. And of course, there’s the Jokerized Robin uniform on display in the Batcave, a reference to the murdered Jason Todd. These Easter eggs point to a strong likelihood of seeing the iconic villains pop up in future Batman films. So, nods are made to a broader DC universe, but without further burdening the already bloated cast. What do you think of Snyder’s decision? Do you wish he had included the two most famous members of Batman’s rogues gallery? Or are you content to wait for the time and room to have more of a focus on them in future films? Let us know in the comments!